My wife hit another home run with this recipe! Quite honestly doing lasagna like this is 10x easier than doing lasagna the normal way AND it's a lot easier to serve. What I love about lasagna is it's easy to put together and you can make it ahead of time. You can either put it together and bake it when you want it OR (the way I like) bake it, cool it, and then reheat it. Pasta always tastes better after it sits for a day or so, all of the great flavors meld together....yummy! So give this recipe a try and let me know what you think in the comments below! Heat the olive oil in a deep saute pan over medium heat. Saute garlic and onion till soft. Add the ground beef and stir to break up the meat. Season meat with salt, pepper, Italian seasoning, and red pepper. Stir and cook meat until browned. Drain meat of excess grease and then add your crushed tomatoes. Lower heat to a simmer and simmer for about 10-15 min. While the sauce is simmering, cook pasta in a pot of salted water according to package directions. In a mixing bowl, add the ricotta cheese, half the mozzarella, half the parmesan cheese, a handful of parsley, egg, salt and pepper. Then mix well. To assemble the lasagna rolls, lay the sheets out an parchement or wax paper. Spread the ricotta cheese mixture along the sheet, then spoon some of the meat mix on each sheet as well. Roll up each of the lasagna sheets individually. In the bottom of the backing dish, spread a thin layer of the meat sauce. Then place the lasagna rolls in the dish and top with some more meat sauce. Spread the remaining mozzarella, parmesan cheese, and parsley evenly over top. Cover the dish with foil, making sure it's not touaching the cheese and bake at 375F for 35-40 minutes. Hello Everybody! I hope you all haven't missed me to much, since it has been a solid month since my last post....I know I've been a very bad blogger for a long time now. But I can promise you that it has not been because I have been lazy! We have had an exciting couple weeks in the Pepple household. My lovely wife got a brand new job as a 5th grade teacher at a very VERY nice Catholic school. Soon after her getting a job, we felt it was about time to make our family a little bit bigger and bought a beautiful little Italian Greyhound puppy that we named Dexter! ------------> He's a sweet and spoiled little boy...we sure do love him a lot! 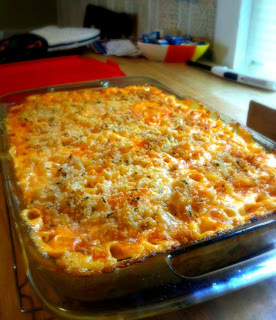 I made this pasta casserole a couple days ago and man was it delicious. Very simple meal that makes a lot and if you have a small family like we do, it makes plenty for leftovers. Spicy sausage and rotini cooked in a creamy, cheesy, roasted red pepper cream sauce. Give it a try, it's awesome! Adjust oven rack to the upper-middle position and turn the broiler onto the high setting. Cut the tops off the red peppers, remove seeds and cut peppers in half (discard seeds and stem). Place peppers skin side up on a foiled lined baking sheet, drizzle with olive oil and place under the broiler. Broil until skins are black and blistered, about 10 min. Put roasted red peppers into a gallon zip lock back and throw them into the freezer to chill quickly about 15 min. When peppers are cool enough to handle. Remove from zip lock bag and peel off the charred skin. Puree peppers in a food processor or blender until smooth and then reserve. Heat olive oil in a large stockpot over medium-high heat. When oil is shimmering, add Italian sausage and brown, breaking into small bits using a spoon. When sausage is nearly done cooking, add onions and garlic and reduce heat to medium. Continue cooking, stirring frequently, until vegetables start to soften and get translucent, about 5 minutes. While sausage and onions are cooking. Bring a pot of salted water to a boil and cook rotini as per box directions until al dente. Add tomatoes, heavy cream, half and half, and reserved pepper puree to sausage mixture. Raise heat slightly and bring to a boil. Let simmer for 10 minutes to allow flavors to meld. Add ricotta, cheese blend, and cooked pasta. Toss to combine. Season to taste with salt. 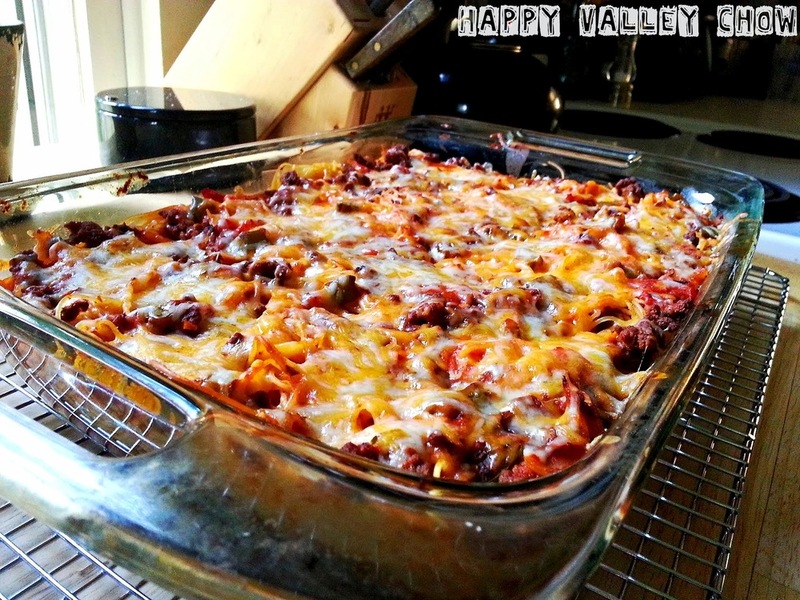 Transfer pasta to a 9- by 13-inch baking pan or casserole dish with high sides. Dot with butter and place in oven to cook until brown and bubbly, about 25 minutes. 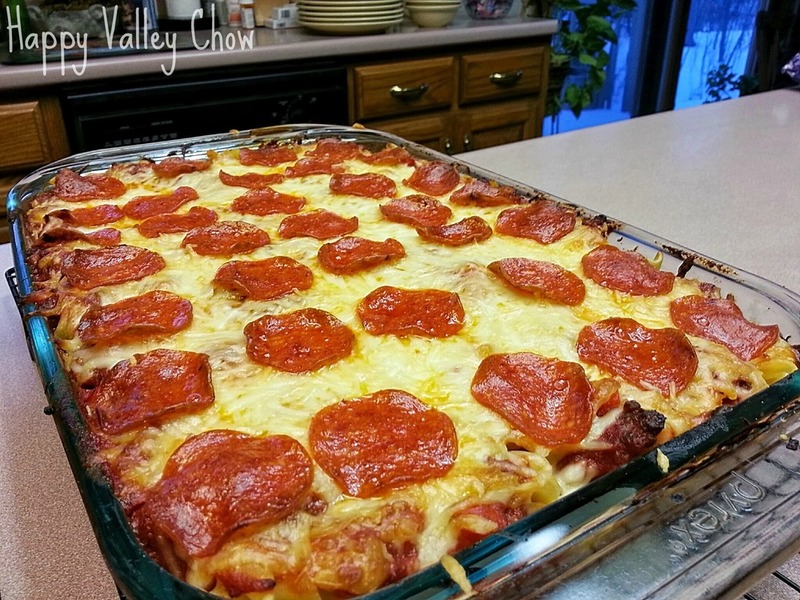 Remove from oven and let rest for 10 minutes before serving with additional shredded cheese. Last week we got a nice little care package from Lee's Grandparents for our upcoming 1 year wedding anniversary. Inside the care package was a lovely assortment of Omaha Steaks products. We got some steaks, hot dogs, and hamburgers. This weekend I was planning on doing something with the steak, but I wasn't in the mood for just regular steak. Then beef stroganoff jumped into my brain and I thought that sounded pretty darn good. Boy oh boy did this not disappoint. It was one of those meals that you start cooking and you just know right off the bat that it is going to be awesome. The smells were amazing and everything was just going according to plan....I love when a recipe goes according to plan. What I got was a creamy and umami filled beef stroganoff that I will be making on a regular basis for sure! Give it a try and let me know what you think in the comments below! In a large skillet, heat 2 tablespoons of the olive oil until shimmering. Add the mushrooms and cook over moderately high heat until softened, about 3 minutes. Season the mushrooms with salt and pepper and cook for 1 minute longer. Transfer the mushrooms to a bowl. Generously season the steak with salt and pepper. Toss the steak with the flour until evenly coated; gently tap off the excess. Heat the remaining 2 tablespoons of olive oil in the skillet. Add the steak slices, without touching, and cook until richly browned, about 5 minutes. Transfer the steak to the bowl with the mushrooms. Add the wine to the skillet and stir to scrape up the browned bits from the bottom of the skillet. Add the wine to the mushrooms and steak. In the same skillet, melt the butter until bubbling. Add the onion and cook until softened, about 3 minutes. Season with salt and pepper. Add the garlic and cook for 1 minute. Return the contents of the bowl to the skillet. Stir in the stock and Worcestershire sauce and simmer over moderate heat until the pan juices thicken slightly, about 7 minutes. Remove from the heat and stir in the sour cream, thyme and parsley. Season the stroganoff with salt and pepper and serve over fettuccine or egg noodles.